LaDonna M. Cook is an Author, Writer, Poet, and Motivational Speaker. She is a Program Coordinator at Goodwill Industries and a contracted Therapist at Malinda Graham & Associates. She is originally from Mississippi and now lives in GA. She discovered her love for words early and started writing poetry pre-teen. It was always her childhood dream to become an author. She loves creating an atmosphere for learning and growth. She has also been a public and motivational speaker for numerous youth groups. She received her undergraduate degree from Alcorn State University in 2005 with a B.A. in Social Work. She has a M.S. in Counseling Studies from Capella University and a M.A. from South University in Professional Counseling in 2012. LaDonna has two wonderful children Landon (5) and Lathan Cook (3). Ladonna wants her true passion of love of writing, her encouraging word, her humble spirit, and compassion for people to be her message. She uses her poetry to release & teach lessons of growth and evolving from transformations in life. Her biggest motivation is to touch someone with her words and engage them to want to change their perspective. She believes that anyone can change the situation they are in. She believes in being positive and fighting for what one would like to happen. She feels that becoming a writer and her love for words, are her greatest gift from God. She became apart of and The League of American Poets in 2007, in a collective anthology called Whispers. 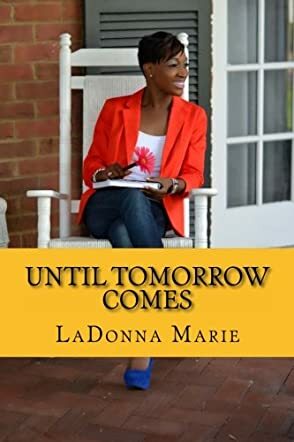 Until Tomorrow Comes by LaDonna Marie is a collection of poems that is motivating and inspiring. It tells the reader to look at their life with a positive outlook and give positive vibrations to the universe. She asks the reader to take a journey inside and find the answers to the problems bothering them. Life is full of problems and everyone has their own issues to deal with. The poet speaks about death, encouragement, faith, childhood, disappointment, and love. The poems in this book are powerful and they deal with topics that are relevant in our lives. I found the set of poems under Encouragement to be very motivating. The poems under each title have their own charm and they all have some message for the reader. The style is simple and stark. The author knows exactly what she wants to convey. The last poem, 'The Closure,' sums up the contents of this collection beautifully. It is a fitting ending to this collection. Writing poetry is not only an art, it is also a gift. Here the poems motivate readers to change their lives by adopting a positive outlook in life, despite the problems they are facing. The author has looked at the lives of people, understood the problems they are undergoing, and also taken instances from her personal life and written poems based on that. Every poem has a message and some of the messages come from personal experience which makes it even more heartwarming and effective. I gave this book a 5 because something about this book touched my heart, alot of the poetry felt like the writer was speaking only to me, I felt like this book was deep and the poems that were written felt real life situations like the writer went through what she wrote about, My favorite poem happened to be one of the shortest but had a big impact on me because I could feel every word on the page, the tittle to that poem is My eyes are open. I have been through a lot in my life so I was able to relate to this book, the book had so much feeling and inspiration I loved it and I'm sure this book is going to touch someone that needs to be lifted, the poems in this book are one's I will reflect on when I am feeling down. Using her gift of words author LaDonna Marie is able to take readers on a rollercoaster of emotions through her book UNTIL TOMORROW COMES. She tackles the good, the bad and all things in between that happen in life and love---and helps us to see our way out of the darkest of moments. Each poem and every section speaks to the heart and gives you hope for the future. One of my favorite poems is "I'm Still Living". In that piece she says this: "Broken down, constant tears, Broken but I'm still here; My days are captured, Trying to hold back my tears; I'm broken, but I'm still here. Looking for love in too many places, Smiling and embraced by a lot of faces, Outside appearances, joy is revealed; Inside the heart pain sits still, For so long, I've carried the weight Of others on my shoulders; Self-sacrificing my own happiness, Trying to lift up others; Who comes to my rescue? Who is there to lift my spirits? I seek a help that is much higher." In that poem, as well as in others, we are able to see one of the ways that LaDonna has been able to find courage and comfort is in her communication with God. Through the good times and the challenges she has learned the importance of not wavering in her faith and not allowing the challenges to stop her. UNTIL TOMORROW COMES is a great resource, showing the value in looking past your troubles to the possibilities ahead.